Potatoes. Eggs. Onions. Olive oil. What is this magic that happens when all of these come together in a pan to make the wildly popular Spanish dish, Tortilla Española? Magic, it truly is because after I made this dish for the first time about 6 years ago, it instantly became a go-to favorite. I've written about this humble dish before but decided that singing its praises again was in order after sharing the tapa (Spanish for 'appetizer') at a recent monthly meet-up of the San Diego Food Bloggers (#sdfoodbloggers or find us on Facebook). I got the biggest compliment when our hostess, @reciperenovator, commented that the taste transported her right back to Spain, reminding her of her time spent there. In Spain, this dish is also known as 'tortilla de patatas' (or papas depending on what region you're in both meaning potatoes). I liken this dish more to the Italian fritatta than what we know here in the States as an omelet as it really bears no resemblance in taste or appearance to it's American, er, French cousins. And even though "tortilla" appears in it's name, it has nothing to do with the Mexican bread products made from flour or corn that I grew up with. Often served in tapas bars, it makes a simple, satisfying dinner especially served with a slightly sweet chilled white wine (try a glass of Pinot Gris or a white Spanish Rioja). Traditionally this is served with crusty bread, either on top of a single slice or between two slices as a "bocadillo" - a sandwich. I personally enjoy it for weekend breakfasts and brunches and so far this month, have made this at elate four times: once as breakfast for a friend before heading out on all day excursion to Julian for apple picking, once for the meet-up, once for this post and then just this week again for dinner. The classic look of the tortilla is dome-like resulting from the omelet pan this dish i cooked in. In Spain, there is actually a special plate reserved specifically for the tortilla flipping portion of this recipe. Domestically, you can order special pans for this dish from here and here. Thickness of the tortillas varies by region and taste. They can be as flat as an inch all the way up to 4 inches in depth. Now that's a tortilla! This updated version is great for one (with leftovers for lunch the next day) or for two. If you'd like to try the full recipe that can serve 12-16 as a tap or easily satisfy a family of four as dinner or breakfast, click here. Use a nonstick pan if you have one. It should have slopping sides and a depth of at least 2 inches. If making this modified for one or two recipe, pan should be about 6 1/2 to 8 inches (mine is an 8 inch). If making the full version, you'll need a 10 inch pan. I don't own nonstick but I successfully use my Calphalon 8 inch omelet pan or my 10 inch (or 12 inch if I'm making it for a party) that I've used so much that they're very near nonstick now. I've used russet potatoes and yukon golds for this dish. Both taste great but I find that the yukons hold up better during the cooking process as the russets tend to fall apart and turn mushy as they cook. Plus, the skin on a yukon is so thin, you don't even have to peel them. An added bonus! Cooking this in steps is best, especially if you're not using a nonstick pan: cook the onions first, wipe out the pan, cook the potatoes, wipe out the pan and make sure that there is no food stuck to it. If there is, quickly scour the pan. I find letting the potatoes "soak" in the egg mixture for 10 minutes seems to make for a more tender tortilla but it's not necessary. Just make sure the potatoes and onions are fully coated before placing into the hot pan. To make it easier to slide the tortilla back into the pan, wet the plate that you'll be using to flip the tortilla out onto first. Don't use eggs straight from the fridge. Take them out and let them come up to – or near to – room temperature. It will help keep them from sticking to the pan. This dish is traditionally served warm or at room temperature making it an excellent dish for entertaining. An authentic tortilla española is made with just these three basic ingredients: potato, onion and egg with olive oil and salt for cooking. However, feel free to experiment once you've mastered the technique. Like pancetta or bacon? Try adding cooked bits of it to the egg mixture. Love cheese? Try adding some near the end of the cooking process or topping it right before serving. How about peas? Those would taste lovely in this dish too. Place an 8 inch nonstick pan on medium high and let heat up while prepping potatoes. Slice the potatoes uniformly using either a mandolin or sharp chef's knife. You want the potatoes about 1/8th - 1/4" thick. Any thinner and they'll turn to mush while cooking. Any thicker and they will take too long too cook. Add 1 tablespoons of olive oil to the hot pan. Swirl to cover all edges of pan. Once the oil is shimmering and starting to smoke, add the onions and sweat until translucent but not browned. Remove to a bowl and set aside. Wipe out pan. Add 2 tablespoons of olive oil to pan. Swirl to cover all sides. Once oil is shimmering and starting to smoke, begin layering the potatoes in the pan, seasoning each layer with a pinch of salt as you go. Carefully flip potatoes, lower heat to medium low cover pan and cook for 10 minutes until potatoes are tender but NOT browned (you're not making fries) stirring and flipping potatoes every couple of minutes. When potatoes are fork tender, remove and add to onion bowl and set aside. Wipe out pan (scour if potato bits are stuck to pan). Return pan to heat. In a small bowl, gently whisk the eggs with 1/4 teaspoon salt. Add the eggs to the potatoes and onion bowl stirring gently to combine and coat all the potatoes. Add 2 tablespoons olive oil to the hot pan. When oil is ready, pour in potato mixture using a spatula to press the mixture together to remove any air pockets. Shake pan vigorously and run a rubber spatula around sides to prevent from sticking. Keep heat at medium high and cook for five minutes, stopping to shake pan every 30- 45 sec. You want to make sure that the tortilla isn't sticking. Once the tortilla starts to set up, wet a plate that is larger than the pan, put it upside on the pan and carefully flip so that the tortilla is now on the plate. Wipe out pan if necessary. Add more oil if needed. When oil is hot again, carefully slide the tortilla back into the pan and continue to cook for 5 to 10 minutes until the egg is cooked shaking the pan periodically to ensure it's not sticking. Slide the omelet out onto a serving dish. Let rest at least 10 minutes before serving. For the life of me, I can never cook the potatoes correctly when making this. I've given up and have resorted to buying the refrigerated hash brown potatoes instead. It may have to do with the size of the potatoes with the traditional tortilla espanola. But yours looks so delicious I may have to give it another try. That looks so interesting! I've never heard of this before, but I feel like I should try it. Thanks for sharing! @Darlene: i tend to have good luck using yukons. i also don't cut them lengthwise the way most española recipes suggest. I slice them in rounds instead and have bette luck. @Syl: thank you for running the test for me! 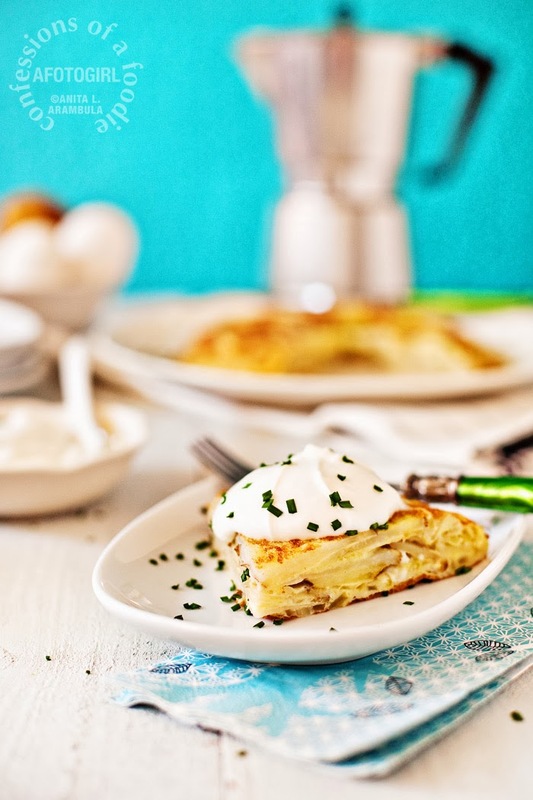 Tortilla Espanola is one of my favorite tapas but for some reason I have never thought of making it myself. But I'm inspired! Looks like this is going on the list of easy weeknight dinners that I know my husband will love. Did you top yours with sour cream? I have had them served with mayo but any excuse to eat sour cream I will take. Oh my! I am so full. I forgot how good these are. Thank you for the recipe and tips. Mmm this is yummy. Top marks for this recipe. Thanks for sharing.